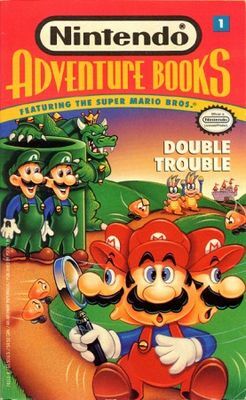 Double Trouble is the first of the Nintendo Adventure Books, published on June 1, 1991. Mayhem in the Mushroom Kingdom. Mario needs your help! Fighting the evil Koopas is all in a day's work for the heroic plumber from Brooklyn. But when King Bowser Koopa concocts a double-dealing plot to take over the Mushroom Kingdom, Mario finds out that double trouble is not double fun. As in all Nintendo Adventure Books, you control the action. Only you can make the choices that allow Mario to beat Bowser and the dreadful Koopa Kids. Help him crack codes, solve puzzles, conquer mazes, and subdue enemies. You and Mario must outwit the Koopas at their own game-or go down in final defeat. This page was last edited on December 22, 2018, at 07:33.